President Obama has delayed any executive action on immigration policy until after this year’s midterm elections. The president noted that part of the reason for this decision was to “make sure we get it right.” Meanwhile several analysts have said that any executive action might energize conservatives and jeopardize the Senate’s Democratic majority given the number of Democrats at risk in toss-up states, most of which have few Latino voters. Last June, the president said that he was going to do what he could before the end of the summer with his executive powers to fix the nation’s immigration system since Congress had failed to pass any immigration reform. Among the many possible actions the president has been considering is deportation relief for some of the nation’s 11.3 million unauthorized immigrants, something which Latinos said was a greater priority than creating a pathway to citizenship, according to a Pew Research Center poll of Latinos last fall. Latinos make up 5% or less of eligible voters (U.S. citizens ages 18 and older) in eight of the nine states with toss-up Senate races (as indicated by Real Clear Politics, FiveThirtyEight and CNN). 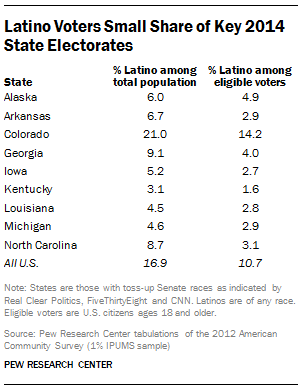 The one exception is Colorado, where Latinos are about 14% of eligible voters. In states where registration statistics are available showing how many Latinos are registered to vote, an even smaller share is Latino. Just 1.9% of North Carolina registered voters and 1.7% of Georgia registered voters are Latino. Latinos also make up larger shares of each state’s total population than they do among eligible voters, reflecting their relative youth and greater number of immigrants who are not U.S. citizens. Whether the president’s decision will impact Latino voter turnout remains to be seen. Historically, Latino voter turnout in midterm elections has been consistently low. In 2010, just 31.2% of eligible Latino voters voted, compared with 48.6% of non-Hispanic whites who voted that year. Nonetheless, the potential impact of the Latino vote is rising. There are more than 25 million Latinos who are at least 18 years of age and a U.S. citizen in 2014, up from 21.3 million in 2010 (though not all are registered to vote). These gains largely reflect the growing number of young Latinos who turn 18 each year, about 800,000 in 2012, and who are often first time voters. In addition, three-quarters of Latino eligible voters live in just seven states — California, Texas, Florida, New York, Arizona, New Jersey and Illinois. Only Texas, Illinois and New Jersey have Senate elections this year, none of which are close. As the number of unaccompanied minors illegally entering the U.S. surged, the public has refocused attention on border security as a priority for immigration policy. That’s particularly true for Republicans, who say by a 53% to 36% margin that the focus should be on better border security and tougher enforcement instead of a policy approach that also includes a pathway to citizenship. Overall just 9% of Republicans say the priority should be a pathway to citizenship. Obama’s expected immigration action: How many would be affected?